The Insecticons; Megatron’s vicious trio of immoral insects. 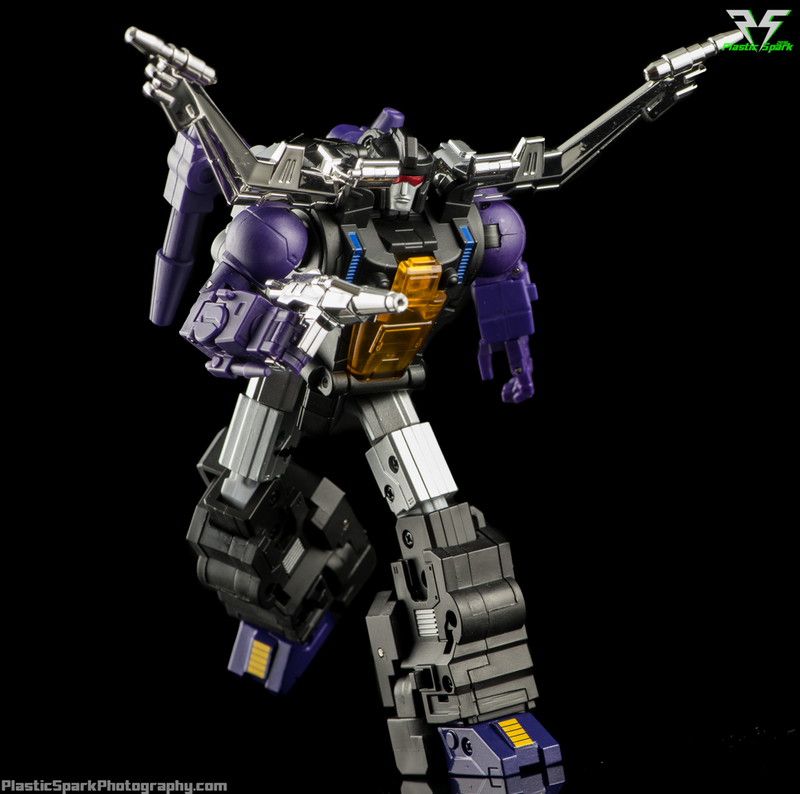 Long have fans waited for a “Masterpiece” style update to these Decepticon critters and Fanstoys have answered with a trio of black and purple bugs that just ooze evil from every pore. The first one to hit my desk is FT-13 Mercenary, their take on the linguistically challenged Insecticon Shrapnel. With a blend of die-cast parts and chrome, this bug bot is a premium piece that’s a pleasure to mess with. I was lucky enough to get a sample on loan from my friends at Blast Off Toys and Urban Pop Shoppe. Without any more prattle let’s move on and check out the review! Taste the lightning lightning ...lightning! 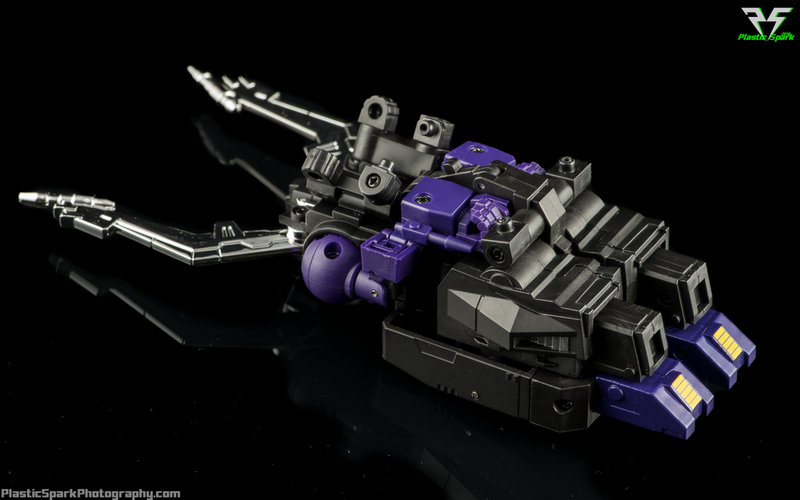 Mercenary’s alt mode is a robotic Stag Beetle. 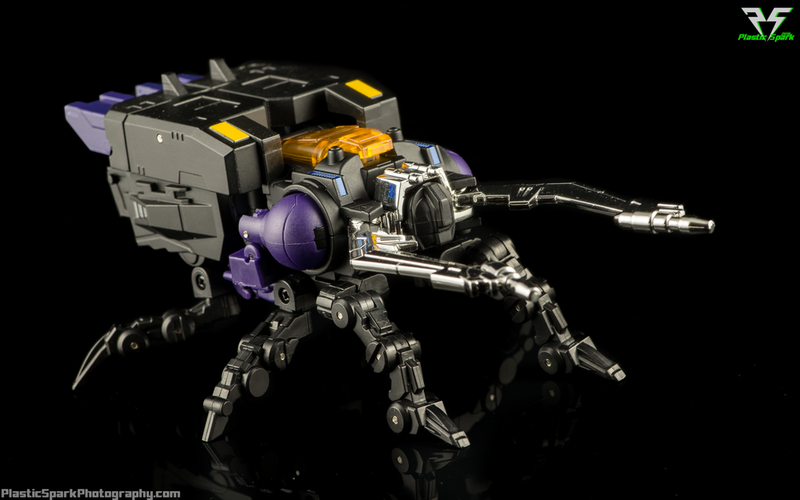 Unlike some of the more realistic G1 alt modes the Insecticons have always been unique in that their “bug” modes have never been much of a disguise as even when transformed they still resemble robotic lifeforms. This is because the original Insecticon designs were taken, much like many G1 toys, from the Diaclone line of toys, specifically the Waruder Insecter Robo toys. Mercenary looks solid and mean in his bug mode with huge menacing chrome tusks and spindly insectoid legs. He’s basically a solid brick with legs and tusks sticking out. 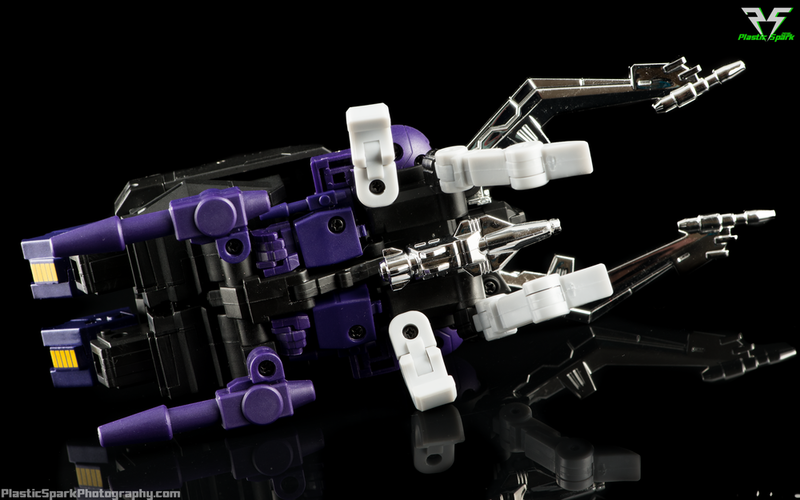 The default legs are multi jointed and have very tight friction swivels that allow for a good range of motion considering the other limitations of the alt mode design. He also comes with replacement legs that can be attached if you prefer a more traditional G1 look with the rear legs resembling blasters or thrusters. I was very surprised to find that the jointed legs actually allowed me to pull off a number of interesting poses and would support Mercenary fully off of the ground even on my slippery photo base. Tickety tackety... it's like a horror movie come to life! Mercenary’s blaster can be stored on the underside of the alt mode, underneath the head area to provide a forward facing attack option. You can also hinge open the cockpit but there is no room inside for a rider due to transformation. I call it the old pinchy blasty. It's not pleasant. The colors and limited paint applications are impeccable and he looks just as unconvincing as ever as a crazy mechanical beetle. Definitely an alt mode well done in reference to the source material. Mercenary’s transformation is a simple affair with a few nuanced twists thrown in that really make for an enjoyable few minutes spent changing him from one form to another. He’s got one fiddly piece that scares me a little, the L shaped brackets on either side of his abdomen. I don’t think they are poor quality or even particularly fragile, but if you are unfamiliar with the transformation and not following instructions I could see these pieces becoming damaged. 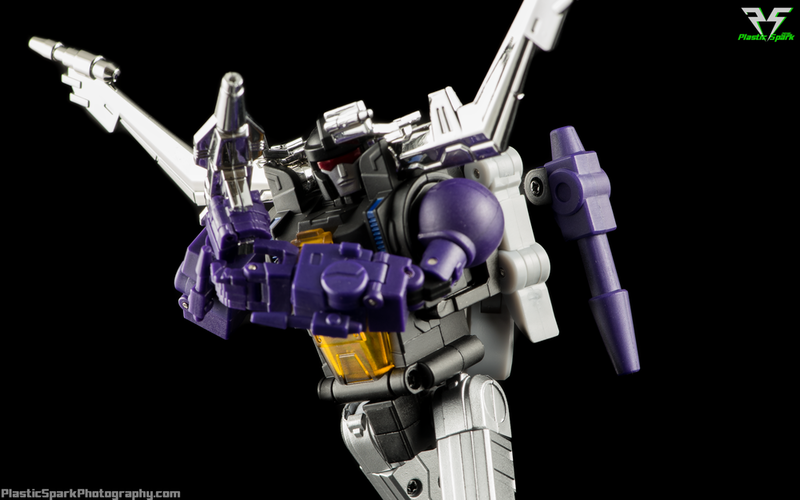 As well, when pulling his shoulders out I would recommend using a small tool to push the die-cast portions in his chest rather than pulling on his arms as I am worried about the longevity of the shoulder connections with multiple transformations. Gorgeous silhouette on this Bug-man! The final result is a fantastic looking Shrapnel analogue that is heavy, posable, and downright gorgeous to behold. He feels fantastic in hand in a way that I didn’t feel with their Spotter figure. The figure feels expensive, heavy, and well-built and I absolutely love manipulating him and putting him in fun poses. I haven’t felt this same “in hand fun” as I’m going to call it in a while. Everything works and none of the joints or articulation points give me pause. The paint and details in bot mode are just as good as alt mode with just the right amount of extra details such as the blue stripes on his shoulders and the yellow stripe down the center of the foot. The proportions are fantastic and he looks menacing and lithe, just like I would envision when watching the G1 cartoon or reading the Transformers comic books. As far as articulation goes he’s got an incredibly competent range of movement. Starting from the bottom we’ve got a fantastic inward ankle tilt capable of balancing in almost any position. The heavy die-cast feet help keep him upright even at more precarious angles. I would have liked to see some outward tilt as well for running poses but this is a commonly overlooked ability even on similar higher end figure lines. He’s got a hair over 90 degrees at the knee and universal joints at the hip with a thigh cut that allows for a full swivel. He’s got a waist swivel that is used for transformation and is fully functional in robot mode. His shoulders are double jointed allowing for a great range of motion and allowing you to hyper extend them if need be. He’s got double jointed elbows and a bicep swivel, wrist swivel, and the familiar, standard issue single hinged hands that most official and unofficial Masterpiece figures have. I really love that he has built in wrist launchers as well. His neck is on a ball joint allowing for a good range left and right, with a modest amount of up and down movement. The stag antlers are on a swivel that allows them to move up and down, though they will also move the silver face cover pieces so there isn’t a lot of adjustment to be done in robot mode. There’s really just one thing that “bugs” me (haha) about Mercenary and it’s those giant silver collar pieces. Yes they are G1 toy and G1 cartoon accurate, but they definitely cause issues when trying to pose Mercenary in a dynamic pose with his head looking to the left or right. You really can’t go very far in either direction without giving the impression that he’s staring back at his own crimson visored reflection rather than the target of his aggression. 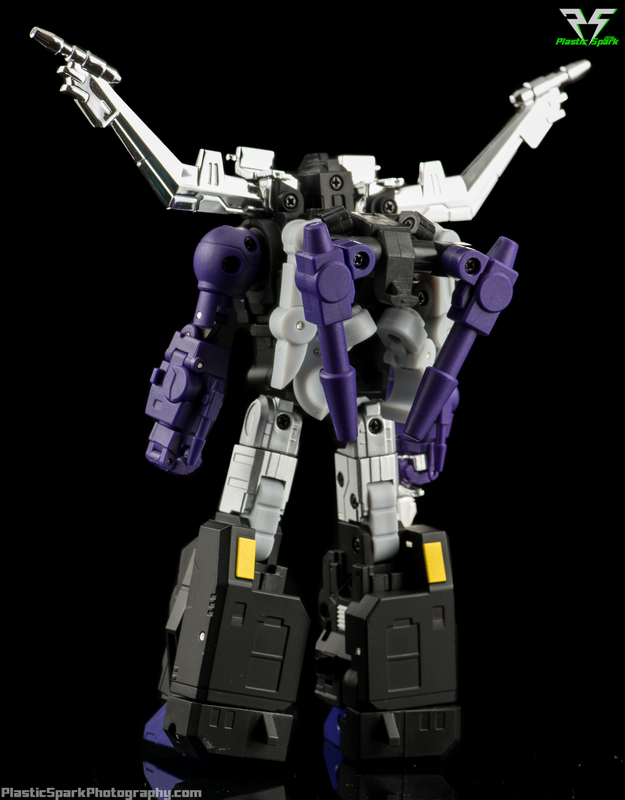 It’s also a bit frustrating that they are connected with the antlers, so if you prefer Shrapnel to have more vertical antlers in bot mode his face will end up covered by the silver blocks on either side of his head. I can forgive them being there as that’s part of the character design but making them one piece that is not able to be left flat while adjusting the stag antlers is frustrating. A face only an insectoid mother could love. The bug legs form a bit of a backpack in bot mode. With the articulated legs it can be a bit of a pain finding the right positions for them but with a little fiddling it can become a fairly compact and lightweight backpack. I personally prefer the look of the simplified legs in robot mode as they fold away tight and don’t tend to move very much when bumped or when manipulating the figure. He's got legs. He knows how to store them! Mercenary’s robot mode is a clean and fun figure that’s a joy to mess with and looks great with other official and unofficial Masterpiece figures. He scales exceptionally well with the Masterpiece car robots and larger Masterpiece Decepticons like Shockwave. 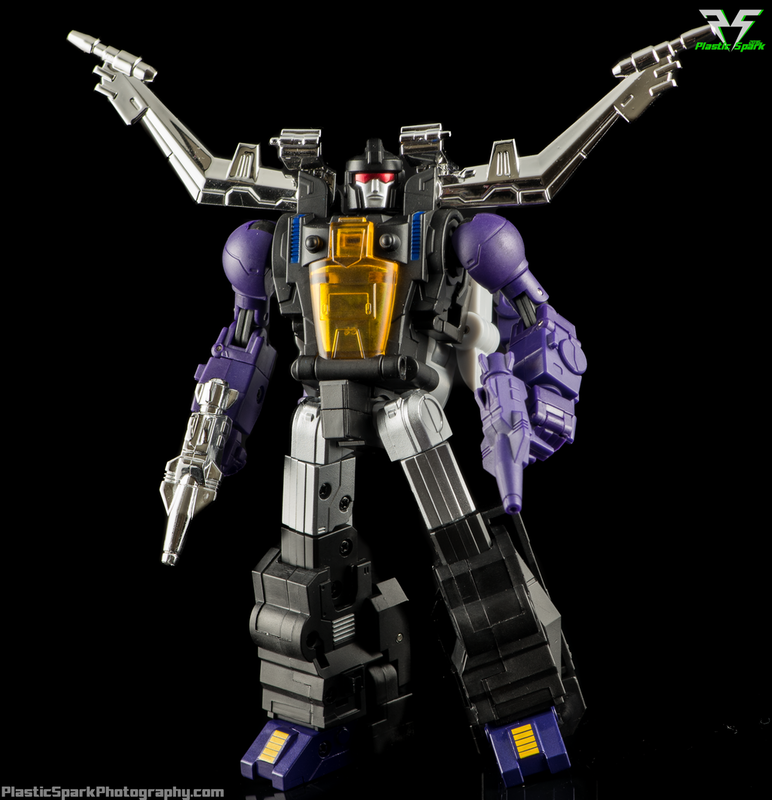 His aesthetics are very close to the official line and while he certainly does exude that certain Fanstoys design style he doesn’t stick out in the same way a figure like Quakewave does. Fanstoys took great care to develop a figure that takes the best parts of the original cartoon model, original G1 toy, and modern engineering and design aesthetics and rolls them all in to one fantastic looking figure. Waiting for the last member of your #Squad. Mercenary’s accessory load out is simple but effective. There are the 2 sets of insect legs. I believe he ships with the articulated legs attached however this sample was not factory fresh at the time of my experience with it so I am unable to say for certain. The G1 legs are my preference in robot mode as they make for the cleanest backpack option and I like the diversity in color. The articulated legs make the bug mode a lot more fun and give a sort of “creepy” feeling when looking at him. 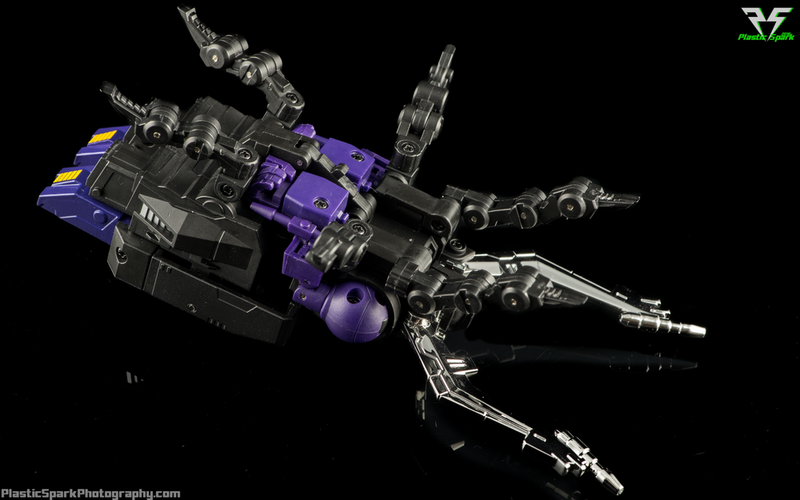 Although it isn’t G1 accurate you can spread them out in robot mode to add spindly legs to Mercenary’s silhouette, similar to Beast Wars Tarantulas. It's awesome that they included this option to cater to both aesthetics. I don't like how the legs attach with a tiny screw as there is definitely a limit to how many times you can swap them without eventually stripping the holes. My advise would be to make a decision and stick with it. A more robust option such as a mushroom peg or clip system would allow for more convenient parts swapping without the risk of failure over time or multiple swaps. 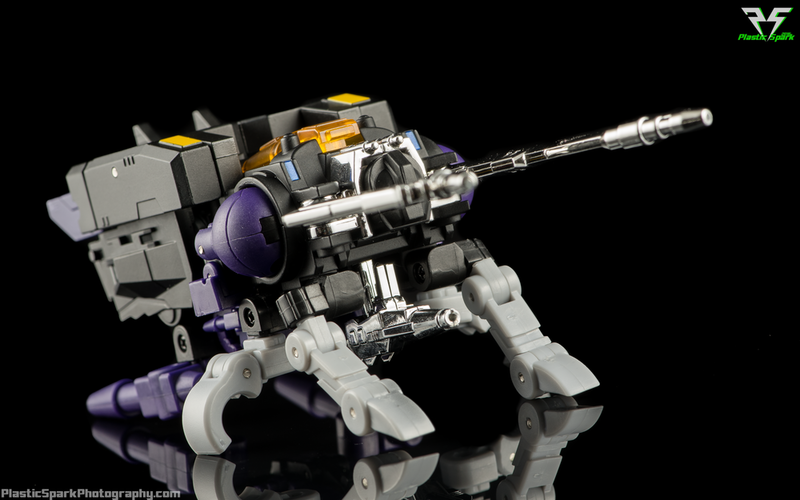 There are 2 pistols, both updated versions of the original G1 Shrapnel’s weapon. A box with a pointed cone tip and small fins on the rear end. One is done in Chrome and one in molded purple plastic. It’s nice that they gave us options as both weapons look good in Mercenary’s hands. I personally prefer the chrome weapon, but it’s nice to have choices, or the option to dual wield. 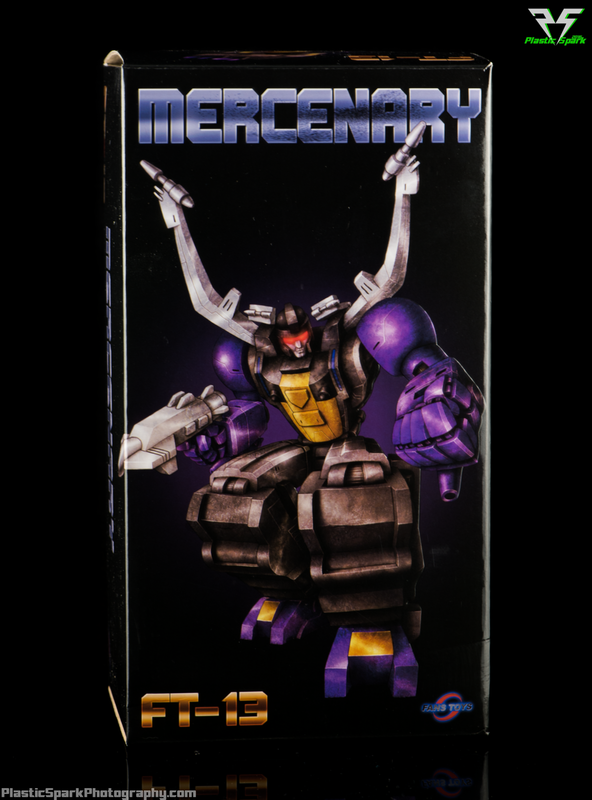 Mercenary comes with 3 small pink energy cubes, similar to the Energon cubes shown in the Transformers cartoon and exactly the same as the cubes included with Spotter. They are a little small for screen accuracy but similar in size to the cubes included with the G1 reissue Insecticons. The last accessory is a replacement chest/cockpit cover. The figure comes with a solid gold/yellow painted chest piece and a clear translucent yellow chest piece replicating the look of the original G1 toys. This copy came with the clear plastic canopy installed and due to the method of swapping the canopies (a tiny screw) I didn’t feel comfortable swapping them as the figure does not belong to me. I personally prefer the look of the solid gold/yellow canopy but again it’s nice to have options. Mercenary includes the typical magazine style instructions and collectors card and is packaged in a thick cardboard box with a 2 piece styrofoam prison to make sure your precious third party cargo arrives safely. Feel the sting Autobot bot bot! I had a really fun time posing and shooting with this figure. He feels great in hand and looks every bit the part of a Masterpiece Shrapnel. Articulation and balance on the figure are great I was able to pull off almost any pose I could think of. Mercenary looks fantastic in photos and on a shelf mixed in with other G1 Masterpiece figures. If you can get some hands on time with one before you purchase I think you’ll understand why I keep saying these figures truly have to be felt in hand to convey the level of finish and quality that is present. FT-13 Mercenary has made me a believer again in Fanstoys after my less exhilarating experience with Spotter, their MP Reflector analogue. I really had a lot of fun with this toy and I look forward to checking out Grenadier next. Check out the full hi-res gallery below and let me know what you think! Leave me a comment below! I would love to hear your thoughts on Fanstoys FT-13 Mercenary!